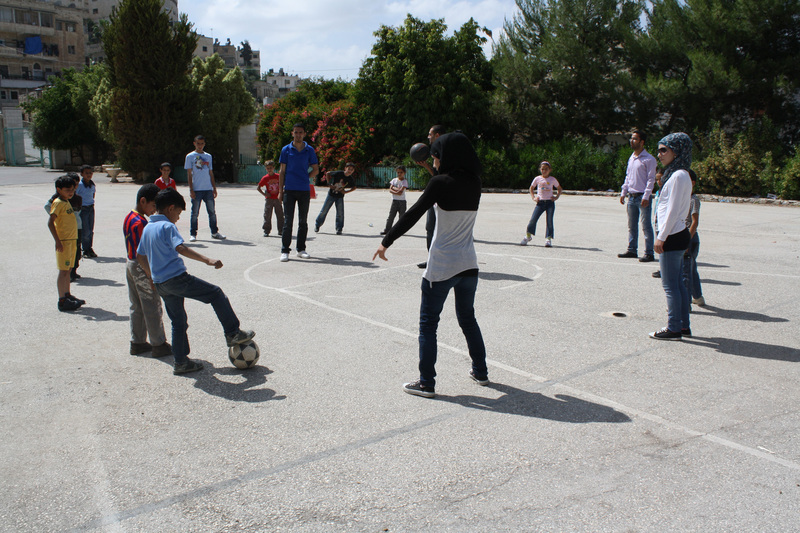 Last Monday TYO spent its weekly field visit in the Hamdi Manko Center, a large, open space near El-Ein refugee camp. We were greeted by fifty excited children, some who were familiar with TYO and some who were new to our program. Ahmad, a current TYO Core Program participant, introduced each and every single one of our staff members to his friends. We were ecstatic to see that Ahmad had relationships with not just one or two, but was close to each one of us. 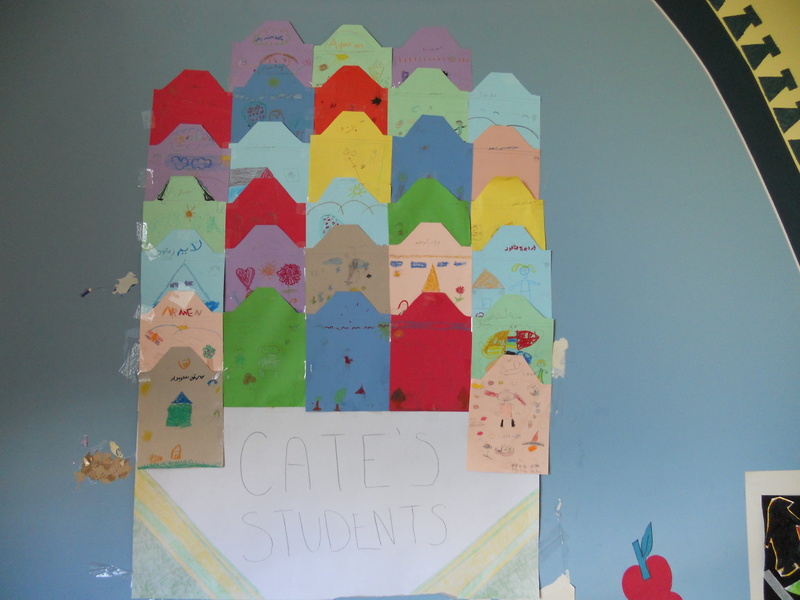 We fell in love with TYO all over again, understanding that it is a center built on meaningful connections between our staff members, volunteers, and, of course, children. Despite growing up in difficult circumstances, we found that even the new children opened up to us quickly. 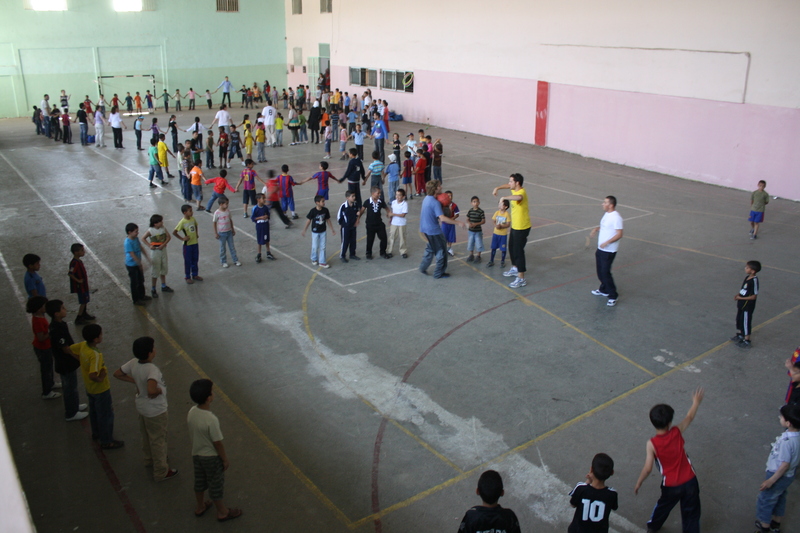 Haitham, one of our wonderful Core Teachers, had students stand in a circle and introduce themselves differently. One of the boys, Mohammad, introduced himself as Hammodah, the loving nickname his mother has for him. We played together for hours and, eventually, ended our day with one of our favorite TYO games: parachute! 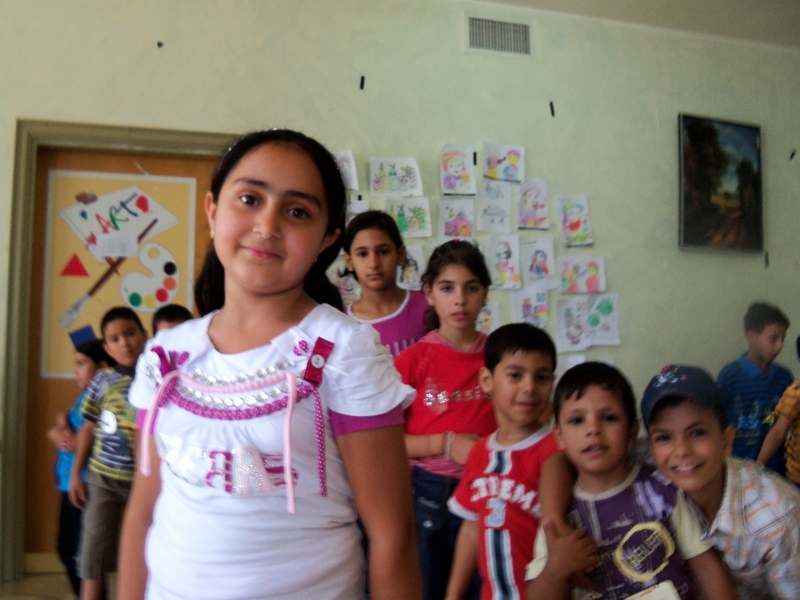 Ala is a Core Program Teacher at TYO Nablus. Each Thursday, we finish our regularly scheduled classes with a camp-wide Sports Day; a fun-filled afternoon of soccer, blob tag, games, laughter, sunny weather, relay races, and just overall exuberance. It’s great to see as my kids begin to leave behind their shyness and self-consciousness in favor of giddiness and a bit of a competitive spirit. This past week, one of my students even proceeded (with a great amount of animation and hand gestures) to break down the steps and rules of a certain game for me and many of her classmates. When I think about my first day of class, when sixteen 8-10 year olds filed into my Arts and Crafts class and quietly took their seats with looks of mild apprehension, the contrast to our Thursday Sports Days is even more striking. That first class, I had expected chaos; I hadn’t prepared for the quiet. In between the critical thinking skills, confidence boosting, English proficiency, and creativity, the interns of TYO have one very simple, but indispensable goal – providing a space for kids to be kids. The Super Seven – interns Alex, Amy, Cate, Mark, Megan, Samin, and Tala – are off and running. Some of us are first time teachers and some are not. Some incorporate the teachings of leading pedagogues and some spend the evenings memorizing Raffi songs. We’ve debated the value of games, activities, and techniques over our friendly neighborhood falafel sandwiches. But, at the end of the day, we just want our kids to enter our classrooms ready to relax, have some fun and, insha’allah, maybe learn a little something, too. Each intern faces unique challenges. Samin teaches English to 9-11 year olds. Developing a flexible and evolving curricula is definitely a complex task. Furthermore, because English is already taught in formal schooling, Samin is also tasked with developing fun, unique teaching methods in line with the informal, psychosocial approach promoted at TYO. How has she responded? She plans to boost students’ sense of self while cleverly incorporating vocabulary with her “Who am I?” unit this summer. Stay tuned to the TYO blog for updates on Sly Samin’s progress in the classroom. Although our strategies vary as much as our favorite Shawarma, we all agree on one thing: it’s all about the kids. Stick with us for updates, projects, victories, whimsical mishaps, and lots more as the Super Seven and TYO’s awesome staff and volunteers work to serve the Nablus community. This is gonna be good. The Core Program revitalized the building here in Nablus last week. The voices, cheer, excitement, and sheer wonder breathed air into the lungs of TYO. Their arrival marks only the beginning of our summer programming, however. This week, we’re back in rhythm and jumping right into a full schedule of classes and projects. Of course, we’ve got a whole bunch of fresh faces in the building. A new crop of great interns has arrived, and having spent the past ten days or so orienting and acclimating, eyes wide and ears open, the seven of them are ready for business. They are eager and rearing to get started, teaching a wide scope of courses from nutritious cooking and women’s fitness to photography and critical thinking. They’re a diverse and talented group about to set off on an amazing journey. It looks to be another great session. Today, we launched the first of our summer Field Days, effectively taking the TYO show on the road and out into the neighborhoods of the people we have served here at the TYO Center for the past three and a half years. Pulling together a dream team of sorts, including Core Program teachers, international interns, staff members, and university-student volunteers, we’ll be traveling throughout the summer to all the refugee camps of Nablus (as well as the Old City) to offer two hours of fun programming, every Monday, for all those children that might not be fortunate enough to attend TYO from week to week. The first day at Askar Refugee camp was great fun, allowing us to reach nearly two hundred new children and spread the TYO message far and wide. In June, six university students from Students of the World (SOW) will join us in Nablus. Their national team, volunteer film crew, comprised of members from universities across the United States, will spend a month with us in Nablus, documenting our new activities and foundational programs. (Check it out: SOW’s NYU chapter spent June 2009 with us and produced this wonderful video.) We are absolutely thrilled to have SOW back in the building. The TYO-MEPI literacy program completed five trainings this month on a variety of topics, including Scholastic’s My Arabic library, leadership, volunteerism, education, and civic engagement. The program’s volunteer corps grew by an additional fifteen local volunteers and seven international interns. This summer, they will teach 220 children (ages 6 -12) how to read. Busy times here in Nablus! And following all our May planning, it feels great to have the beating heart of the community back in the building. While all of the other children started drawing and decorating self-portraits of themselves in the present and in the future, Mahmoud sat still staring absent-mindedly at the table filled with art supplies. 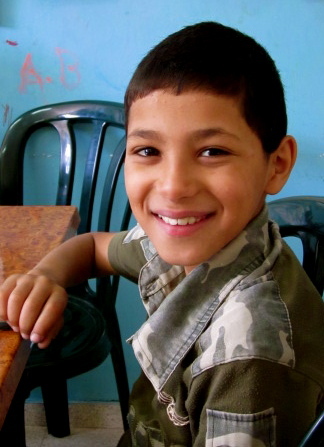 His brother Ahmad tried to give him oil pastels and paper, but Mahmoud refused to take them. He exclaimed that he just wanted to sit and not draw anything, but something made me feel that there was some other reason Mahmoud did not want to draw. Over the past few weeks, I had noticed that Mahmoud never picked up a marker or crayon voluntarily during free time drawing despite the wide variety of colors and choices. Even when he finally picked one up, he would often just hold it in his hand and not use it. This lack of interest in doodling or drawing baffled me considering the fact that he continued to come week after week to my Arts & Crafts class. He was a good student who always listened carefully during storytelling, helped clean up at the end of class and was generally in a good mood. Why did he not want to color and draw like the other children? Hannah is an intern at TYO Nablus this summer. The cheers and laughter could be heard throughout the neighborhood last Wednesday when more than 100 children took part in an Open Day at the TYO center. That day, TYO Core Program kids took a break from their normal classes to play games, create art, and watch a clown performance. 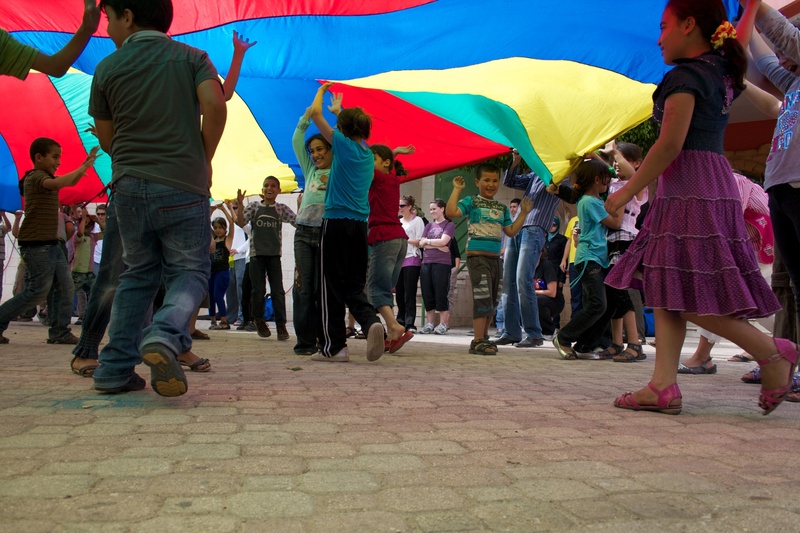 Each semester, TYO schedules “open days” both as a treat for the kids and as a way to introduce TYO to other Nablus community groups. 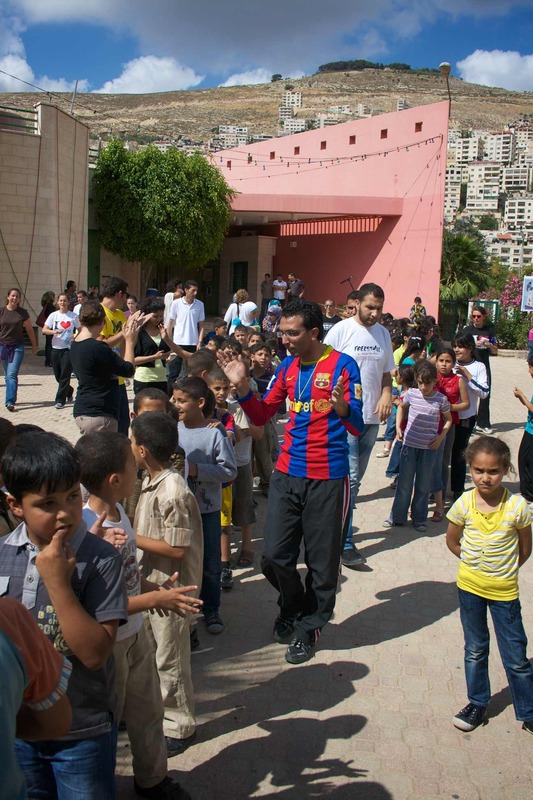 This time, 30 children from AMRA organization, an NGO specializing in IT training in Nablus, joined in the fun. In this way, open days are an important way for core program participants to share what they’ve learned at TYO with kids from other organizations and neighborhoods while hopefully making some new friends along the way! 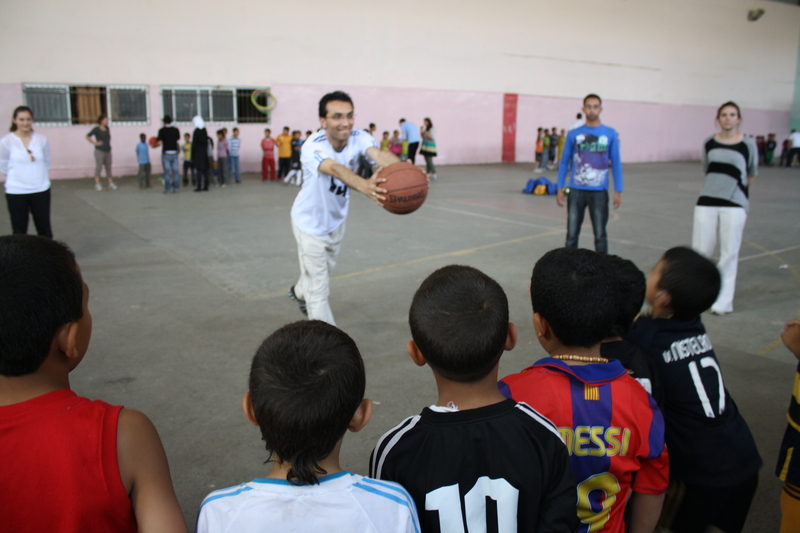 The day’s events were coordinated by TYO Sports teacher, Haitham Okeh, and included many activities learned from Right to Play trainings. 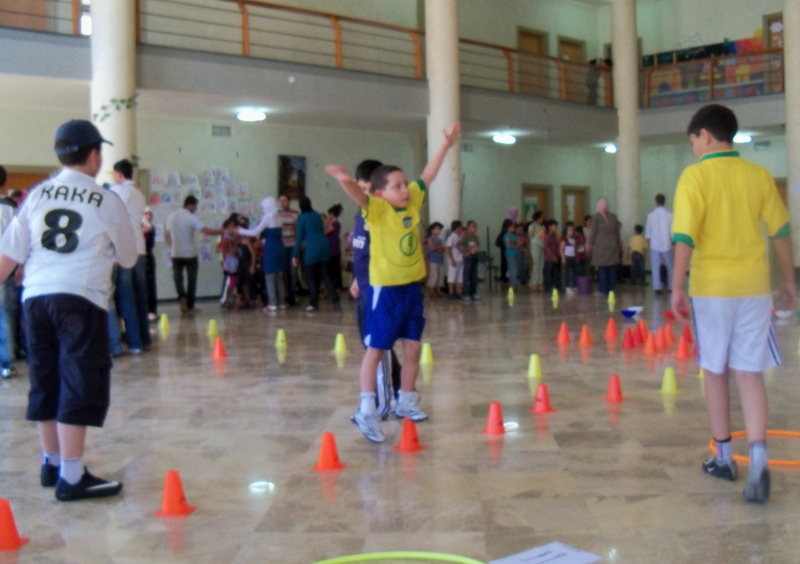 Teams of kids, supervised by TYO youth volunteers, rotated through eight relay race stations. They sprinted around cones; hopped on balls; bowled; and tossed beanbags into rings. The competition was stiff, but win or loose everyone enjoyed cheering and playing throughout the afternoon.